Although the concept of Ocean Literacy originated in the USA, many elements of the work done by our USA based colleagues can easily be applied to a range of settings here in the Australasian region. As a result, Andrew Walsh at the Woodbridge Marine Discovery Centre in Tasmania has put together the following links between the Australian Science Curriculum and the 7 Ocean Literacy Principles. 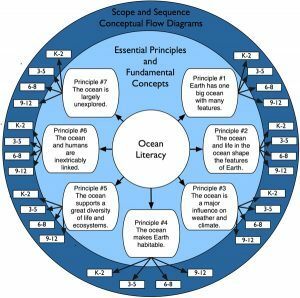 Similar work done in the USA, including the Framework Diagram (shown to the right) displaying Scope and Sequence Conceptual Flow Diagrams for all 7 Ocean Literacy Principles, is highly relevant to educators in the Australasian region. 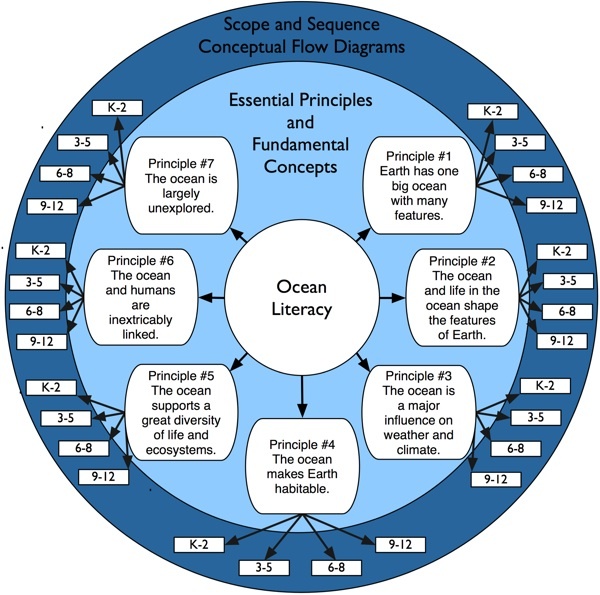 The USA based Framework Diagram displaying Scope and Sequence Conceptual Flow Diagrams (source: Ocean Literacy Website). As with the original work to create the concept of Ocean Literacy, the following efforts to create the Framework Diagram (shown to the right) was an inclusive, democratic and transparent process where work was mostly done online. This process built on and credited past efforts and was carried out without institutional ownership. In 2005 there was an iterative review process of to create a draft framework and a brochure was published in (the USA) summer of 2005. Between 2006 and 2009 four drafts of the Scope and Sequence developed, reviewed and refined. The Scope and Sequence was first published in 2010.